Choose from a variety of styles of decorative inlay banding. 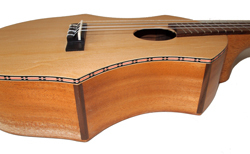 Use this around the edges of your instrument for a beautiful binding. Each piece of inlay is 36 inches long. Check the description for the width. Not sure of how much to order? See the bottom of this page for help in figuring out the quantity you will need for different instruments. Here are some guidelines for the instruments we carry to help you purchase the correct amount of banding. Each inlay strip is 36" long.